In case you are finding it difficult to access or navigate through the content or pages in this Website, the following summary of what each section of the Website containswill help you have a better experience in browsing. UIDAI Home: Direct access to Aadhaar Online Services, latest news, press releases, Videos, analytics and other important information. About UIDAI: A brief background of the establishment of the Authority, information on the organizational structure, contact details of various divisions and Regional offices, Grievance Redressal, Citizen Charter, RTI, current vacancies and more. Legal Framework: AccessAadhaar Act and corresponding Rules, Regulations, Notifications andCirculars. Enrolment & Updates: : Information and resources relating to process of Aadhaar Enrolment, Aadhaar Generation, Aadhaar Data Updation and roles and responsibilities of Enrolment ecosystem partners. Authentication: : Information and resources on Aadhaar Authentication, Biometric devices, roles and responsibilities of partner agencies. 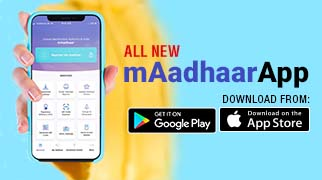 Media Centre: Repository of Aadhaar related news items (print, audio or videos) published in various newspapers or channels; press release; Advertisements, and educational videos about various Aadhaar and related services; and Aadhaar Brand guideline. Resources: Repository of notifications, Tenders, Circulars, Office Memorandums, and Parliament Questions on Aadhaar, Enrolment and Authentication related documents. Search: Search through the contents of this Website by giving appropriate key-words. Aadhaar Online Services: Single window providing direct access to all Aadhaar online services such as Locate Enrolment/Update Center, Check Aadhaar status, Download Aadhaar etc. FAQs: Provides answer to myriad question relating to Aadhaar and Aadhaar based services. Glossary: Provides definition pertaining to abbreviations, technical words and phrases used with relation to Aadhaar. Analytics: Dynamic display of Total Aadhaar Generated and Total Authentication done till date. What’s New: Transitory container for latest news or press releases. Media room: : Highlights latest educational videos on Aadhaar Services/features, interviews and speeches telecasted in various channels. UIDAI in News: This dynamic section displays the daily headlines relating to Aadhaar and UIDAI sourced from various news channels, All India Radio and Press Information Bureau (PIB). Social Stream: Displays the live feed from UIDAI’s social media pages in Facebook and Twitter. Visitor’s Counter: Besides the total number of visitors, the section also displays the total visit count of previous day-week-month. Accessibility Statement: The Website is accessible to all users irrespective of device in use, technology or ability. It has been built, with an aim, to provide maximum accessibility and usability to its visitors. Site Map: A hierarchical index of the menu of this Websiteisdisplayed in a contextually structured manner. Feedback: Any query or viewson yourexperience with respect to the Website can be registered here. On this Websiteaudios broadcasted on All India Radio can be found under Aadhaar Broadcast section. You can listen to them by clicking on the Play button. You shall also find links to videos of speeches, interviews given by CEO of UIDAI at national and international events such as conferences. In Aadhaar Telecast and Aadhaar Videos section you can view informative and promotional short films on various Aadhaar and related services. The videos are drawn from Aadhaar Channel in YouTube. We are committed to ensure that the information or this Website is accessible to all users irrespective of device in use, technology or ability. It has been built, with an aim, to provide maximum accessibility and usability to its visitors. We have tried to ensure that all information on this Website is accessible to people with disabilities. For example, a user with visual disability can access this Website using assistive technologies, such as screen readers and font magnifiers. This Websiteis designed using PHP on Joomla platform, and complies with World Wide Web Consortium (W3C) Web Content Accessibility Guidelines (WCAG) 2.0 level AA. Part of the information in the Website is also made available through links to external Web sites. External Web sites are maintained by the respective agencies/departments that are responsible for making these sites accessible. The UIDAI Website complies with World Wide Web Consortium (W3C) Web Content Accessibility Guidelines (WCAG) 2.0 level AA and Guidelines for Indian Government Websites. This will enable people with visual impairments access the Website using assistive technologies, such as screen readers. The information of the Website is accessible with different screen readers, such as JAWS, NVDA, SAFA, Supernova and Window-Eyes. The information provided by this Website is available in various file formats, such as Portable Document Format (PDF), Word, Excel and PowerPoint. To view the information properly, your browser need to have the required plug-ins or software. For example, the Adobe Acrobat Reader software is required to view the PDF files. In case your system does not have this software, you can download it from the Internet for free. The table lists the required plug-ins needed to view the information in various file formats.